Fifty years ago, John Kennedy was inaugurated as the 35th President of the United States. On January 20, 1961, he gave what many historians would consider one of the greatest speeches of the 20th Century and it is the moment, in large measure, when the decade truly began. It's exceedingly valuable to review some of the differences between how Richard Nixon and John Kennedy presented themselves during their first Presidential Debate. It was one of those rare moments that history pivoted on - and people knew this even as they were watching it. The Nixon-Kennedy Debates were the first U.S. Presidential Debates in over a century and they would be the last until Gerald Ford and Jimmy Carter met in 1976 - but they've been a staple in the American political process ever since. A little known fact - is that the first time Kennedy and Nixon debated was in 1947. They were both freshman congressman and in McKeesport, Pennsylvania they debated "The Taft-Hartley Act". The two men considered themselves friends and even shared a room on the Capitol Limited (a train line) that night on their way back to D.C. The first of the four 1960 Presidential debates took place on the night of September 26, 1960 in Chicago - but a significant event occurred several weeks before in North Carolina. Richard Nixon had severely injured his knee there and he had to take two weeks off from campaigning. He recuperated in Walter Reed Medical Center and his infected knee received antibiotic injections while he grew understandably frustrated. He lost weight. Mr. Nixon still looked sick and run down on the night of the debate. While putting in long hours trying to make up for lost campaigning time, and only hours before the event, he re-injured his knee and thus was in a good deal of pain while on camera. The temperature of the studio that night was warmer than most would find comfortable. This coupled with Nixon's knee pain, caused him to perspire noticeably during this first ever televised U.S. Presidential Debate. He was seen blotting his face with a handkerchief several times that night. Richard Nixon didn't freshly shave for this evening event, and while he refused to use stage make-up, he did use a product called "Lazy Shave" which was supposed to hide his stubble. But it only served to make his sweat more noticeable. 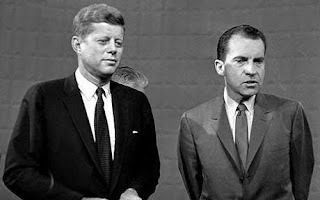 During the first debate, Nixon wore a suit jacket that was close to the same color as the stage background. Subsequently, he blended-in and was physically, poorly-defined. Kennedy, on the other hand wore a dark suite which contrasted well against the background and made him strongly stand out. This "visual metaphor" gave the impression that he was more well-defined - beyond that of his physical appearance. John Kennedy was well rested, uninjured, relaxed, tan, freshly shaved and well-prepared. He had spent many hours practicing for the debate, while Nixon was "campaign-cramming" up to the last minute. Immediately after the event, Nixon's Mother had even called him to ask if he was ill. In stark contrast, Nixon is on record writing, "I've never seen him (Kennedy) so fit." While the radio listeners gave Nixon the slight edge in post-debate polling, they made up the distinct minority of those in the country. By that time, 88% of American homes had televisions and the Debates were watched by over 50% of Americans. Television viewers gave Kennedy the win by a landslide. They didn't vote with ears, they voted with their eyes. There are those who doubt the significance of body language. While Kennedy won the debates convincingly, the election was one of the closest in American history. The debates made all the difference. Many historians feel that Nixon, had he been elected, would have taken the Joint Chiefs advice rather than refusing it as did Kennedy. Thus Nixon would have very likely responded with direct military force (rather than the Kennedy-directed Naval blockade) during the Cuban Missile Crisis in October of '62. Most historians feel this more aggressive action would have probably precipitated a nuclear war. The mighty doors of history swing on small hinges. Analysis # 2133: Dan Quayle and Lloyd Bentsen Debate in 1988 - "Senator, You're no Jack Kennedy"
Analysis # 2135: Ronald Reagan in Nashua, New Hampshire - "I'm Paying for this Microphone Mr. Green!"